James Nolan of Kenyon Street, Nenagh, an anti-Treaty soldier was killed on Monday August 14, 1922, when a mine he was planting at Nenagh Barracks exploded prematurely. The dead man was a 32 year old father of one. member of an anti-Treaty guerrilla-style cell was captured with 6 other members in Kildare on December 13, 1922 and taken to the Curragh Military Detention Barracks in Co. Kildare for trial. Sentenced to death, Patrick and the others captured with him were duly executed by firing squad at 8:30AM on December 19th at the Curragh Barracks. bear his death with “the Courage of an Irish Father & Mother. A shorter letter to his younger brothers and sisters asks that they remember him and his comrades on Christmas only a few days away. Patrick Bagnall (19), Fair Green, Kildare. 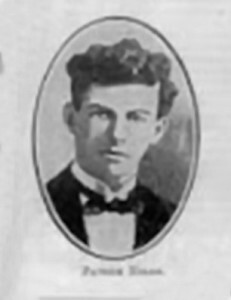 Martin Nolan, Ballywilliam, New Ross, of the Kyle Flying Column, was one of four members of his group killed on March 23rd 1923 after being pursued. James Nolan of the Irish Volunteer Training Corps (or the GR’s) died in Dublin. This Corps of soldiers was the first to suffer fatalities in the Rising. On Monday April 24th the GRs left Beggar’s Bush Barracks and marched to Ticknock. On completion of the exercise they marched back to Beggar’s Bush where they came under heavy fire from the Rebels who kept up continuous shooting from the corner house at 25 Northumberland Road and Haddington Road. J. Nolan, 8692, Rifleman of the Royal Irish Rifles, born and enlisted in Dublin, died April 24th 1916, aged 20. He was the son of Mrs. M. Nolan of 48 Power’s Court, Mount St., Dublin. Patrick Nolan, Boland’s Mills, served in “A” Company, 3rd Battalion, Dublin Brigade. Born in 1895 he died on the 12th of April 1979. He fought at Boland’s Mills, on Grand Canal Street and along the Dublin and South Eastern Railway Line between Westland Row and Lansdowne Road. He also fought during the War of Independence and remained with the National Army up to 1924 being a Lieutenant with the Mechanical Transport Corps. George Nolan, Marrowbone Lane, served in “A” Company, 4th Battalion, Dublin Brigade, fighting on Marrowbone Lane throughout Easter Week. On the day of the surrender he was ordered by Con Colbert to deliver letters to Fathers Kiernan and Eugene at Mont Argus and after delivering the letters he was not to return to Marrowbone Lane, as a result he was not interned after the Rising. In 1917 his Company was reorganised and he fought throughout the War of Independence. At Christmas 1920 he was recruited into a full time Active Service Unit and took part in several attacks on British personnel including Colonel Winters and the burning of the Customs House. Michael Nolan, Enniscorthy, served in “A” Company, Enniscorthy, Wexford Brigade. Aged 47 years old at the time of the Rising, he fought at the Athenaeum, Saint John’s Mill, Cooperative Road and Slaney Road Enniscorthy and at Manor Mills Enniscorthy. He joined the Volunteers at their inception in Enniscorthy in 1913 and was also a member of the I.R.B. Arrested at his place of work on Tuesday the 2nd of May, he was taken from Enniscorthy to Waterford and then to Richmond Barracks Dublin before being deported to Stafford. He was released from Stafford on May 17th 1916. He had no further activity with the Volunteers or I.R.A. and did not take part in the War of Independence or Civil War. Bartley Nolan served as a Volunteer in the Castlegar Company of the Galway Brigade, Irish Volunteers. Aged about 20 years old during the Rising he fought at Carnmore Cross, Agricultural Station Athenry, Moyode and Limepark County Galway. He went on the run after the Rising and was captured on May 9th. He was released from Frongoch Prison at the beginning of August 1916 and re-joined the Volunteers on reorganisation in 1917. He took no part in the Civil War. In this picture taken at Croke Park on Sunday, 11 September 1921, the Dublin hurling team looks on, as a very happy Harry Boland smiles directly at the camera and Michael Collins shakes hands with James Nowlan (1862–1924), GAA president, Sinn Féin representive and Kilkenny Alderman. Less than a year before on 21 November 1920, British forces had stormed into Croke Park during a match, killing 14 civilians. Less than a year later, on 2 August 1922, Boland was dead from a gunshot wound and 20 days later, on 22 August, Collins was assassinated at Béal na Bláth. James Nowlan was a member of the Gaelic League, a lifelong supporter of the Irish language revival movement and a supporter of Sinn Féin from its founding in 1905. 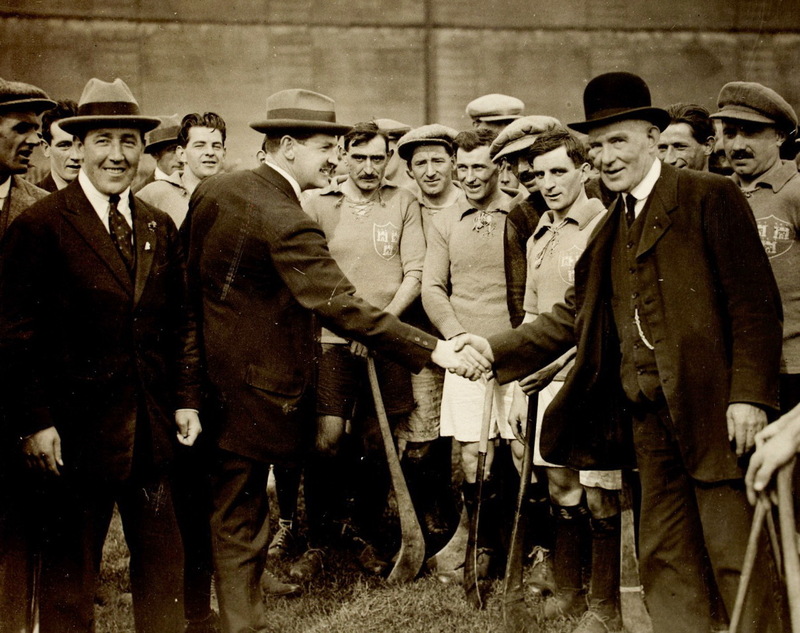 He was President of the Gaelic Athletic Association from 1901 to 1921. He held that position for twenty years – making him the longest serving GAA president. Following the 1916 Easter Rising, Nowlan was arrested by the British and interned without trial in Frongoch, Wales. In August of that year he was released. He publicly voiced support for the Irish Republican Army during the Anglo-Irish War. Nowlan Park, the GAA stadium in Kilkenny, was renamed in his honour. He is buried in Glasnevin cemetery. At about 6.30pm on July 26, 1914 along Bachelors Walk beside the Liffey River the King’s Own Scottish Borderers (KOSB) returning to the Royal Barracks (now Collins Barracks) were confronted by a hostile crowd of about 600. When the KOSB had reached about 100 yards of the Ha’penny Bridge, the crowd was right behind them at which point the soldiers were ordered to block the street. They fired on the crowd. Four people died and many more were injured, including John Nolan of 44 Cabra Road, Dublin, who received a bullet wound to the leg. On 24 February 1917, at Buckingham Palace, King George V honoured Louisa Nolan just 18 years old with the Military Medal for her actions during the 1916 Easter Rising in Dublin. According to the Sinn Féin Rebellion Handbook, she tended to wounded officers and men during the battle on Mount Street Bridge. Official British casualties accounted four officers and 216 other ranks killed or wounded during the engagement at Mount Street. Seventeen Volunteers had taken up defensive positions in buildings along the street. Four Volunteers escaped through the rear of the buildings evading capture. Louisa Nolan was the daughter of the former head constable of the Royal Irish Constabulary (Ireland’s police force before 1922). After the Rising, Louisa Nolan moved to London where her two sisters were nurses. Her two brothers were in the British Army and Navy respectively. A third brother was killed in August 1916 on the Western Front during World War I.
Galway, St Francis Abbey – John Nolan (c1733-1793) – of Loughboy?? Based upon the writings of James Hardiman in the early 1800s (History of Galway), we also know that an older Nolan memorial is known to have existed on the grounds of St. Francis abbey, having been refurbished sometime before that by a Michael O’Nolan of Loughboy. To my knowledge, for reasons unknown, no recent visitor to the abbey has been able to locate this memorial which presumably existed in the early 1800s when Hardiman wrote about it. Could the tombstone inscription for John Nolan (c1733-1793) have been etched unto the older existing Nolan memorial? Based upon my experience this would certainly be a possibility, perhaps using another side of the stone. I would therefore suggest that the headstone found by Jim (James F. Nolan of Wisconsin) be more closely inspected to see if traces of earlier inscriptions can be found. Putting this possibility aside and reflecting upon who the John Nolan who died in 1793 might have been, a promising lead is found at the website documenting Galway’s Landed Estates. From the information found at the website it is evident that a John Nolan of Loughboy existed in the 1700s but one generation earlier than the “John Nolan” buried in the abbey courtyard. Could the John Nolan (1774-1820) of Loughboy documented on a webpage at the Galway Landed Estates website have been the son of the John Nolan buried in the St. Francis abbey courtyard? Circumstancial evidence pointing in this direction certainly exists! Recall that it was a “Michael O’Nolan of Loughboy” who erected the older, now lost (? ), memorial to the Nolans of Loughboy. That the John Nolan buried on the grounds of the St Francis abbey be of the Loughboy Nolan family would be consistent with the fact that Nolans of Loughboy had already been buried there in earlier times. John Nolan of Loughboy, Co Mayo, 1774-1820. John Nolan of Cloonaville, county Sligo & John Nolan of Logboy, county Mayo re repayment of loan, 1810.
by John Nolan Ferrall, May 1855. For anyone interested in the Nolans of Loughboy, Lugboy or Lugboy (current spelling) , Co. Mayo, an article entitled “The Nolan Chantry” and relating to a descendant of the Nolan-Ferrall family, a Monsignor Edmond Nolan, son of John Nolan of Logboy, was published in the March 2015 edition of the Nolan Clan Newsletter. From this article and other sources it would appear that this line of Nolans was of the Roman Catholic persuasion as would have been the John Nolan buried on the grounds of the St. Francis abbey. At this point I would also like to express my sincere thanks to Jim Nolan of Wisconsin and his wife for bringing to our attention the old Nolan tombstone in the courtyard of St. Francis abbey in Galway city. Roger Nowlan, webmaster and Nolan Clan Newsletter editor. (with references) which I uncovered relating to the Cecil and Nolan family motto i.e. “Cor unum, via una”. made earlier by Wayne Nolan. Attached are a few references which, in my opinion, are relevant to our discussion on the “early origins of the O’Nolans of Connaught”. as tradesmen/craftspeople supplying services to the Anglo-Normans of Connaught (e.g. carpenters, metalworkers, etc.). 1228-1316 de Burghs take over Connaught. The Nolan Motto “Cor Unum Via Una”. was established in the late 1500’s or early 1600’s by Thomas Nolan of Ballinrobe. The motto used by Thomas Nolan of Ballinrobe “Cor unum via una” is the Cecil family motto. It is probable that Thomas changed the given old O’Nolan motto “Semper Fidelis” given to them for their known fidelity to the Kings of Leinster for the Cecil motto. If Thomas was by any chance a Carlow Nolan the fact of his taking office with Elizabeth would make him anxious to forget his old connection for many reasons and to cement his friendship with his new allies. Thomas Nolan was in direct communication with the Cecils through Sir Richard Bingham and perhaps in more direct correspondence. Sir Thomas Cecil (second Lord Burleigh) visited Connaught and was a great friend of the Binghams with whom Thomas Nolan was much allied. A kinsman of Cecil, Barnaby Goore held an office in Connaught either with Thomas Nolan or only a few months before Thomas Nolan was appointed Clerk of the County of Mayo. Has anyone ever heard of the motto “Semper Fidelis” or can anyone supply a reference to this motto as we are researching for a newsletter article and would like some help.